Villa Jessica is a three bedroom villa which can sleep up to 8 people. 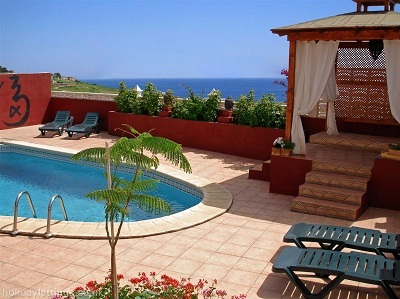 It is located in the town of Adeje and is only a 5 minute drive from the beaches of Costa Adeje. The villa is extremely high quality and has a private pool, which can be heated on request. There is a pergola with comfortable seating and a Thai style mattress for relaxing, as well as plenty of sun loungers. There is also a secure childrens' play area and a roof terrace. The lounge has sofas and comfortable seating for 8 people and a dining table and chairs for 8. There is satellite TV, DVD player and CD player. There is also a games room downstairs with a billiard table, table football and darts board. Two of the bedrooms have king-size double beds and the 3rd bedroom has 3 single beds. There are 3 bathrooms: one family bathroom, one ensuite and one shower room with walk-in shower. A deposit is required to secure the booking. The balance of the booking fee can be paid in cash on arrival.